In Januari I blogged about a New style of AppleHDA.kext patching (take III) for Mavericks, and today I changed AppleHDA8Series.sh for Yosemite – tested with 14A261i. HDMI audio is not yet functional, but I am working on a new update that should, hopefully, eliminate manual patching altogether. At least for people who use my AppleHDA8Series.sh script. And you know what. It may even be better than what Clover offers today, because with Clover you still need to know the exact data pattern that you want to alter. Not something you should have to deal with, with every OS update, and that is why I like to introduce something new. Something so simple that it makes me wonder why nobody, including me, ever thought about it. 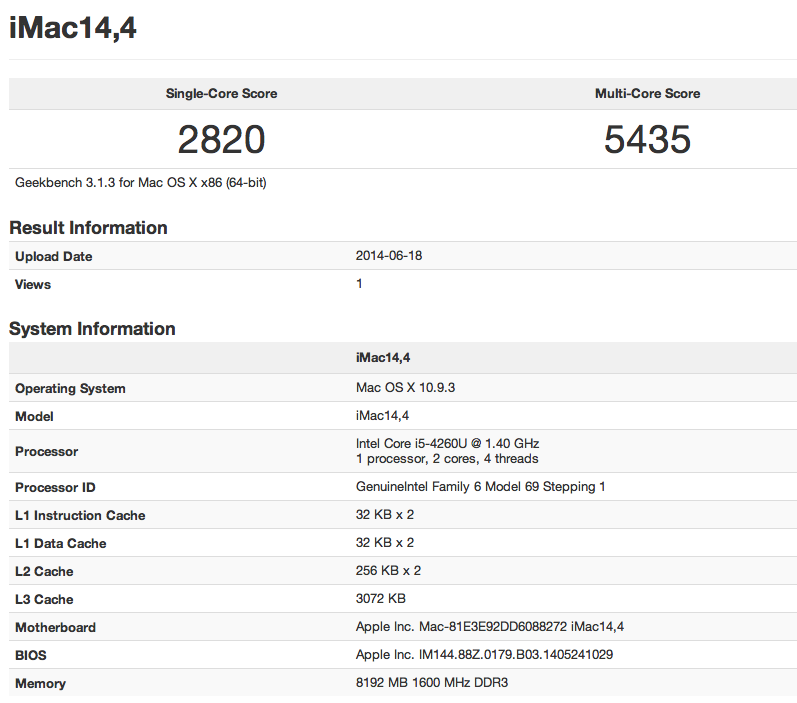 Here is the Geekbench score of the brand new entry-level iMac with the Intel Core i5-4260U processor running @ 1.40 GHz. Here is the new SMBIOS data for RevoBoot, but you can easily adapt it to Chameleon, Chimera or Clover. The page is not there right now, but should soon be made (Edit: Done. Available right now). Update 1 of the OS X Yosemite Beta was released to developers earlier today. The first update using the new name. This to me is only a logical move, to stop confusion among future OS X Beta Seed Program members – interested end-users without a (paid) Mac developer membership. The domain/default pair of (/Library/Preferences/com.apple.SoftwareUpdate, CatalogURL) does not exist. Ok. 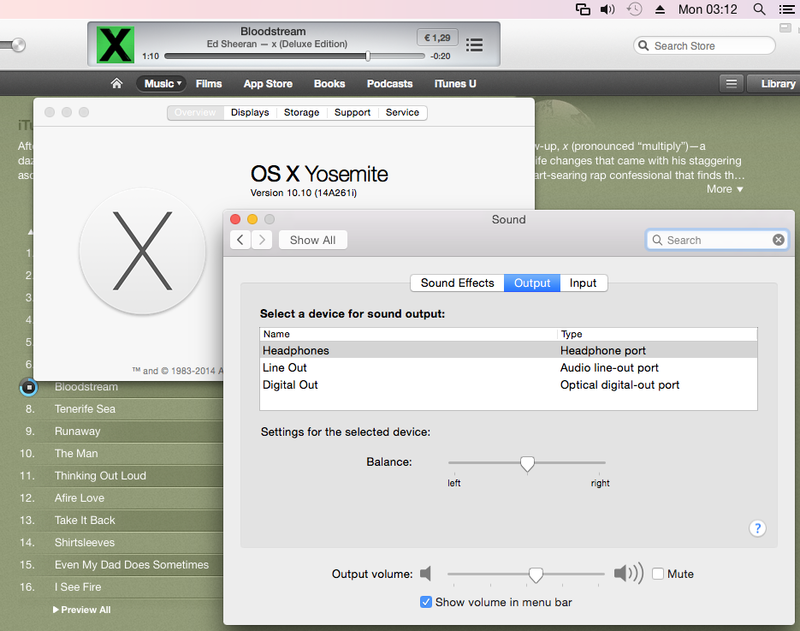 So the Yosemite Developer Preview 1 includes two new files called: appleLogo.efires and sound.efires Wait what. Sound? 0000030: 0000 0000 696e 666f 0000 0000 0000 003f ....info.......? Cool. So this is actually a file in Apple Core Audio Format. And adding a .caf file extension should change the icon and then we should be able to play it with the QuickTime Player. Yup. That worked. Perfect. Note: run sudo chmod +x efires-xtract before running it. Expect an update after my coffee break! Crap. I used an old HDD for my Yosemite installation and it started to make funny noises. Like tick tick tick. Won’t boot up anymore. Had to re-install Yosemite and get stuff going again, which was why my coffee break went on forever. I now also added the PNG image sizes, and here is a cool new find. Add “meter=0” under ‘Kernel Flags’ in /Library/Preferences/SystemConfiguration/com.Apple.Boot.plist and the good old throbber is back. This setting also removes IODeviceTree:/chosen/IOProgressColorTheme (Number) 01. I also changed RevoBoot, in my local repository, and now it loads: /usr/standalone/appleLogo.efires to get the Apple logos – gray or white, and scaling (1x or 2x) also works. Just like Boot.efi does. For your info. The new BlackMode loads the white Apple logo, instead of the gray Apple logo, on a black background. Here is a proof of concept, showing you how to load and show the new Apple logo images in Yosemite. It should be fairly easy to port the code to Chameleon/Chimera. Edit Typo fixed in logo scaling (@2X -> @2x). Apple seeded Build 13E16 of OS X 10.9.4 to developers. Made available through their Software Update mechanism in the Mac App Store, as well as through the Mac Dev Center. An almost forgotten update due to our focus on the first developer preview of OS X 10.10 (Yosemite). Sorry about that. Anyway. I blogged about newly discovered power management resource files in the first developer preview of 10.9.4 like two weeks ago but things have changed a little since then. But this one is still there. We’ve learned that the latest MacBook Air is using the same board-id as the previous model, it was after all only a minor spec-bumb, so guess what. The new iMacs may also be using the same board-id, because only a minor spec-bumb is to be expected. That is if the rumours are true. Which unfortunately also means that the new Retina iMac won’t make it before Q4. Sounds plausible to me. The IGPU only power management resource file could either be used for a new iMac, or for a new Mac mini. Whatever happens, happens, but my guess is that Apple will drop the price for non-retina iMacs and add a new Retina iMac for few hundred dollar more. Add a new Mac mini and a lot of people will be happy. Very happy indeed. DELETE FROM object WHERE id = ? SELECT 1 FROM object WHERE current_cdhash = ? Deprecation Note: Startup items are a deprecated technology. Launching of daemons through this process may be removed or eliminated in a future release of OS X. Maybe this is just a start and can we expect more cleanups, but for now… let’s just wait and see what the next developer preview brings. At least now you know why your rc.local and/or rc.shutdown.local scripts aren’t working anymore. Time to write that plist. See man launchd and man launchctl for tips like where to put your plist. /System/Library/LaunchAgents Mac OS X Per-user agents. /System/Library/LaunchDaemons Mac OS X System wide daemons.